of sizes and construction materials. Image courtesy FTI Flow Technology, Inc. Precision turbine flow meters are specially designed to accommodate a broad range of precise fluid measurement applications, though differing models and variants tend to be targeted at specific application conditions. They accommodate greater flow rates with lower pressure drops than other meters in their class. The turbine rotates as process fluid passes through the instrument, and special pickups placed around the perimeter of the meter sense the passage of the rotor blades. This produces a high-frequency digital output suitable for interfacing with an assortment of processing, readout and recording equipment. Some turbine flow meters have a symmetrical bi-directional design that supports reverse flow applications without a reduction in accuracy or capacity. The following paragraph is mostly excerpted from "FT Series Turbine Flow Meters", an IOM published by Flow Technology, Inc. (document ID is TM-86675, Rev AG) ...with some editing. 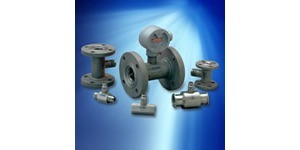 A turbine flow meter is a volumetric flow measuring instrument. The flow sensing element is a freely suspended, bladed rotor positioned axially in the flow stream with the flowing fluid pushing against the blades. The rotational speed of the rotor is proportional to the velocity of the fluid. Since the flow passage is fixed, the turbine rotors rotational speed is also a true representation of the volume of fluid flowing through the flow meter. The rotation of the turbine rotor generates electrical pulses in the pickoff that is attached to the flow meter housing in close proximity to the turning rotor. Each one of these pulses represents a discrete volume of fluid. The frequency or pulse repetition rate represents the volumetric flow rate and the accumulated pulse total represents the total volume measured. A turbine flow meter is a mechanical device. The primary moving part is the rotor, but its balance and bearings need to be kept in good working order to avoid offset of the flow reading. Regular maintenance commonly involves withdrawing of the rotor and internal parts from the body and conducting a cleaning and inspection for corrosion or contamination of the rotor assembly by accumulation of foreign material. In some cases where foreign material buildup is inevitable, a means to isolate and flush the meter with a solvent after use can contribute greatly to reducing the overall maintenance burden. Electrical connection and grounding requirements for turbine flow meters are similar to other process measurement instruments. Mechanical installation requires consideration of a number of factors that my impact unit performance. Delivering properly conditioned flow to the instrument inlet and removing or dampening forces and conditions which may produce velocity profile disturbances is a key element of a successful installation. Paying careful attention to flow conditioning at the outset of installation and planning will yield results for the life of the unit. 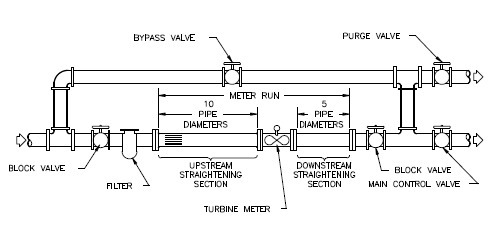 Here is an example of a recommended installation profile, courtesy of FTI Flow Technology, Inc.
Schematic representation of turbine flow meter installation. Turbine flow meters, with their simple, durable construction and wide operating range, are an effective and beneficial choice for a number of industrial process applications. As with all instrumentation, there are a number of factors to consider when making a selection. Share your flow measurement challenges and requirements with instrumentation specialists, combining your process knowledge with their product application expertise to develop effective solutions.